I just wanted to share my brother in laws amazing story with you guys because it is so inspiring. I know there are so many families that are affected by cancer and my family knows personally how hard it can be. But miracles do happen and my brother in law is proof of that! I am so proud and thankful to have him in my life. He truly is a inspiration. ALEX SLITZ/TREASURE COAST NEWSPAPERS Bullfighter Stephen Bruner, of Indiantown, prepares to corral a bull after a rider is bucked off during Rodeo Bible Camp at Gethsemane Ranch in Indiantown Wednesday. In 2011, Bruner was diagnosed with Stage 3 testicular cancer and in 2012 surgeons removed one of his testes and tumors around his back. 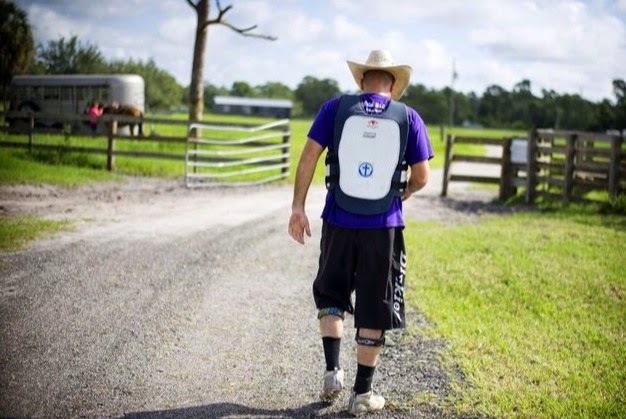 After the surgery Bruner could barely walk, fearing he wouldn’t be able to return to the rodeo. “I figured for sure I was done with it and God kept telling me no your not, you’ll be back in that arena,” Bruner said. To see more photos, go to TCPalm.com. So great to see someone doing so well. My husband died almost 4 years ago of cancer and it is the hardest battle. Great to see him doing what he loves after fighting the battle of his life. Great story & I'm glad he's doing well! Wow. What an an amazing story! This is so inspiring. God does truly does work miracles. Thanks so much for sharing this and sending many good thoughts your way! wishing you guys all the best! loved reading such an inspirational story. thanks for sharing. Thank you for sharing this. It is such an inspiring story. You brought tears to my eyes. BRAVO to him. My mom passed away of cancer. You hear about it and see it everywhere but until you see up close and firsthand what that person is going through you have no idea how bad it can be. WHAT AN INSPIRATION...amazing man! Thank you for sharing! This is such an inspiring story! I know this is so random but I found your blog through another blogger, and then saw that you posted this article. I went to college with Stephen and although we weren't close friends we were in the same circles and I have kept up with his story through Facebook. He is so inspiring in all that he does and I am so happy for his continued healing! I am a new follower of your blog for sure!